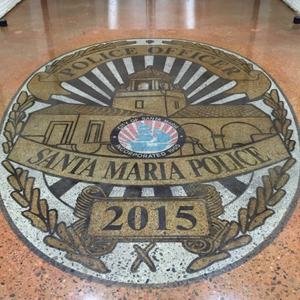 As concrete contractors servicing Santa Barbara, San Luis Obispo, and Monterey Counties, our clients often ask us why we suggest various flooring systems for their projects. These are always great questions! If you are considering a new flooring system for your industrial concrete floor, we want to share with you our five reasons why we choose epoxy flooring (when we do choose epoxy flooring) for industrial flooring systems. Yes, you read that right. An epoxy coating can be stronger than the concrete flooring beneath it. In some industrial flooring installations, we want to add strength, so we will want to choose epoxy flooring. If your industrial flooring is going to see heavy traffic, heavy loads, or potentially heavy impacts, and you already have existing concrete, the epoxy will bond to this concrete and can be built up in layers. A concrete contractor will need to review your existing concrete to determine the condition of it and if epoxy coating will be enough (just how big is your tank again?). Most epoxy flooring has a compressive strength value of 10,000 psi, though there are stronger epoxies out there. We’re located in Paso Robles, California – wine country. We see a lot of agricultural installations of epoxy flooring for wineries because red wine spills and stains everything during production. When coating concrete flooring with epoxy, it creates a barrier which prevents moisture from going through it down into the concrete below (or up if you are concerned about moisture coming into a barrel storage room). In industrial applications where there will be water or moisture or the need to sanitize, such as wineries, hospitals, and kitchens, we strongly encourage the use of epoxy flooring. But it isn’t stain proof, so that red wine will need to be wiped up as soon as possible. Industrial floors that have seen a lot of abuse without any maintenance from a concrete contractor over the years can often be restored with epoxy coatings. Chips, cracks, and stains can be forgotten about thanks to the self-leveling qualities of professional epoxy flooring systems. This may seem like an “out of sight, out of mind” technique, but remember that epoxy flooring is often stronger than the concrete substrate underneath, so once the epoxy is bonded to the concrete, the restoration job of those damages is as-strong or stronger-than any other type of concrete-on-concrete repair. If the location of the flooring is in a high traffic area or an area where it will receive both foot traffic and moisture, we frequently recommend epoxy flooring due to its slip-resistant quality. Even when wet, epoxy flooring offers better traction under foot and under tire. Many garages, hospitals, agricultural plants, breweries, wineries, and kitchens opt for epoxy flooring for this reason above everything else. Epoxy flooring is not always gray with black and white flecks. In fact, that stuff you see at the home DIY store might even be water-based and nothing like what a concrete contractor will install. 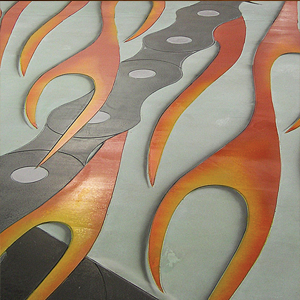 We offer artistic epoxy flooring options, even for industrial flooring applications. These can be beneficial for Aerotech applications, museums, and other light-industrial installations where patrons will also be seeing the floor. High gloss finishes are always available, as are pearlescent and metallic flakes. 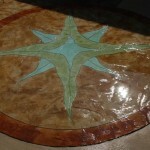 Patterns and shapes can also be created using epoxy. If you are considering a new flooring system for you industrial, commercial, or residential floor, contact us for more information about epoxy flooring and our other concrete flooring systems. 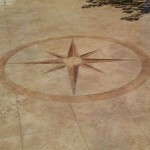 Pristine Concrete is a decorative concrete contractor serving the central coast of California. Industrial flooring systems have different needs than residential or even commercial concrete flooring systems. Often times, industrial concrete flooring systems demand higher performance from the concrete – but that doesn’t stop it from having a decorative finish. There are high performance decorative solutions for industrial concrete flooring that can meet the needs of any industry. We’re often asked which industries are a “good fit” for industrial concrete flooring systems. Many people first think of a warehouse when they think of industrial concrete flooring, but when decorative applications are factored in, taking high performance concrete with pristine design and color combinations, the industries which can benefit from these concrete flooring systems are nearly endless! In industrial concrete applications, we have three decorative concrete choices we suggest the most often: polished concrete, stained concrete, and epoxy flooring. These three decorative concrete solutions offer a variety of color choices including mixed-in color and additional flake in some cases (see our gallery here) without losing the high performance integrity of the concrete. And if you have existing concrete you are looking to restore and apply a decorative finish to, these decorative finishes can still be an option. Existing concrete flooring can be brought back to life and improved to meet the high performance demands of industrial flooring through polishing. HTC Superfloor™ is an economical, environmentally friendly, and durable concrete polishing system we use which mechanically strips away the concrete paste on the surface to expose the stronger layer beneath. This stronger concrete layer is then polished to a beautiful, easy to maintain shine (no wax needed). HTC Superfloor concrete polishing has been used on the museum flooring underneath massive tanks. In very large-scale industrial applications with existing concrete, concrete polishing can provide a better appearance and more durability. 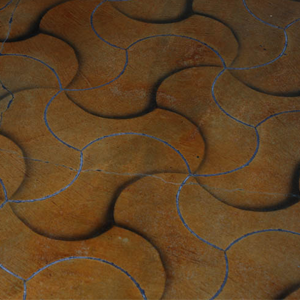 We also use RetroPlate™ systems for concrete polishing. Some industries will find their system offers a better benefit for the job. Like HTC Superfloor, Retroplate will strip away the top surface of concrete paste to expose the lower, stronger layer of concrete, but RetroPlate uses mechanical and chemical components getting deeper into the existing concrete flooring for a deeper restoration process. RetroPlate also meets OSHA and ADA SCOF standards and qualifies for use on LEED projects which may be important in your industrial application. In many polished concrete flooring applications, the final product remains gray although it will have a beautiful glossy shine. Enter concrete stain. Acid staining concrete becomes a permanent part of the concrete and won’t face, chip, or peel away like paint, which is what makes stained concrete a perfect decorative solution for industrial concrete applications. 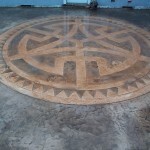 Acid staining concrete is where the creativity and uniqueness of your industry comes into play as the color choices and designs are endless. Custom walking paths can be etched with acid stain into a large polished walkway at an aquarium without breaking apart any existing concrete slab. 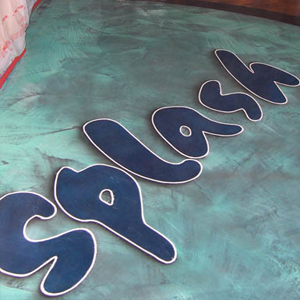 Branded colors and logos can be put into flooring like a seal at the center of a business or at an entryway to greet employees or customers. But it is important to know that stained concrete is not as strong as unstained polished concrete and does require some care and maintenance to maintain the vivid colors once complete. 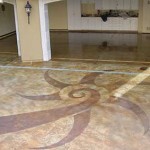 We recommend using a sealer over stained concrete. The frequency depends on the location: UV exposure, foot traffic, chemical spills like wine, etc. In industrial flooring environments where heavy objects might be dropped, oils might spill, and acidic compounds might stain, our clients often choose epoxy flooring. Epoxy flooring has a high compressive strength while also resisting drops and spills, which is why we install it in commercial and industrial garages, hospitals, kitchens, and agricultural plants (especially for wineries here in Paso Robles). Epoxy flooring offers singular flat colors with a high gloss shine, or they can be mixed with large or fine-grit flakes in a spectrum of colors, including pearlescent and metallic, which opens up a world of color design in epoxy flooring. 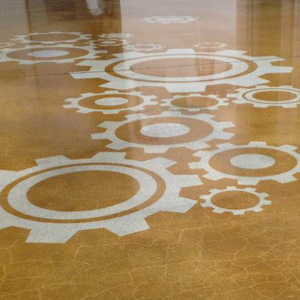 Industrial Concrete Flooring Doesn’t Have to be Dull! We’ve just gone over our three most common solutions for providing decorative concrete flooring in industrial applications. These are relatively quick jobs, even on the large-scale of an industrial job, so there is no reason why your business needs to suffer from dull flooring that is difficult to maintain, chips under pressure, and maybe even needs maintenance for cracks. 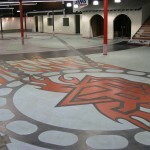 Industrial flooring has the highest demands of any concrete flooring and shouldn’t be neglected. It carries the heaviest load of any system in your business! When transforming a commercial kitchen into a soon-to-be five-star restaurant, it is important to work from the ground up. We suggest epoxy flooring for the best start! Commercial kitchens in California have very high expectations placed on them to produce some of the most amazing food in the country. Here on the central coast of California, we see so many amazing restaurants between Santa Barbara, San Luis Obispo, and Monterey Counties that it would take a lifetime to try them all. Unfortunately, not all of them make it before everyone gets to try it as there is a lot to consider when opening a commercial kitchen. Something often overlooked is the kitchen flooring. Bare concrete flooring is porous and can harbor bacteria; the smallest crack in the concrete flooring can create a safe haven for food particles to grow mold and fester. And wet, untreated concrete? Let’s not talk about how many slip and fall accidents happen in commercial kitchens each year. By coating the concrete flooring with an epoxy, all of the cracks and crevices are sealed and a moisture-resistant barrier is created to prevent bacteria from having a place to hide and grow. This protects the patrons and staff of the restaurant from an accidental case of food poisoning (did you know the CDC estimates 48 million people get sick and 3,000 die from foodborne diseases each year?). The epoxy flooring is also easier to clean from drips and spills with this new barrier, partly from removing those deviations from the smooth surface and also by creating the moisture-resistant barrier which spills will not seep through or cling to. The epoxy flooring can be sanitized. The other major health risk of the commercial kitchen next to food-borne illness is the slip/fall accident. But don’t worry about adding extra slips with this new epoxy coating – you’ll be removing them. Another reason epoxy flooring is great for commercial kitchens is the added benefit of its anti-slip surface – even when wet. Commercial kitchen floors see a lot of water, intentionally or not, and epoxy flooring can handle it, which protects your staff from taking a tumble. Epoxy flooring can also handle drops. No commercial kitchen likes the idea of a pot being dropped on the floor, but if it does happen, you don’t have to worry about scratching the floor. The epoxy coating is often used in garages where tools are frequently dropped, which means it can handle the ladle hitting the floor, too. This protects your investment over time, making epoxy flooring a great choice for the busy commercial kitchens we see here in California. And don’t worry, epoxy flooring can be installed in even the most luxurious of restaurants of Santa Barbara, San Luis Obispo, and Monterey. 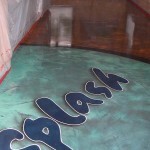 Epoxy flooring comes in a variety of colors and glosses, including pearlescent and metallic flakes. Would you like your floor to look like a bronze platter? We can do that! Singular colors and color mixes with large or high-grit flakes can produce a wide variety of patterns and color blends. Check out our gallery for ideas. Stamped Concrete is possibly the most common form of decorative concrete in use, which means if you own or manage a wine tasting room, you likely have a slab of stamped concrete around. If so, do you know how to properly maintain it? And if you’re looking at adding new flooring in or around your wine tasting room, is stamped concrete a good option for you? The experts at Pristine Concrete are here to help! We’re located in the heart of wine country: Paso Robles, California, so we understand the needs of wine tasting rooms and we’re experts on concrete. Let’s start with the basics: what is stamped concrete? 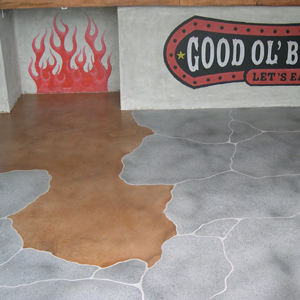 Stamped concrete is a poured concrete that has been custom fit into a slab of any shape your tasting room needed, indoors or outside. Then, a stamp was used to morph the concrete into a woodgrain, slate, brick, tile, cobblestone, river rock, plank, or other (usually Earthen) shape. The concrete was probably colored when it was poured and given extra coloring when it was stamped. This gives it a beautiful appearance when complete that tends to blend right in with its surroundings. As many tasting rooms like to go with a natural look in Paso Robles that is in harmony with the vines and Oak trees, stamped concrete is very popular here. If I Already Have Stamped Concrete, Does it Need Maintenance? The short answer: probably, yes. When was the last time you sealed your concrete? If you do not know the answer to this, then the answer is definitely yes. 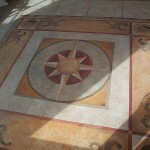 Decorative concretes are sealed when they are first finished. Depending on U.V. exposure and foot traffic, they may need to be re-sealed more than once per year or as infrequently as once every five years. This will preserve the color of the concrete and prevent staining (spilled red wine, perhaps?). Some sealants are also slip resistant, which is good for your patrons, and water/spill resistant (to really keep that red wine out of your porous concrete). We offer concrete maintenance – if you would like to have an estimate for sealant, simply contact us for an estimate. Is Stamped Concrete Good for the Environment? Yes. We believe in being environmentally friendly with decorative concrete. If you are considering re-doing the flooring inside your tasting room or the winery itself, know that concrete flooring is more energy efficient, has lower maintenance needs, and keeps waste out of the landfill. You can also prevent fumes from flooring installation upsetting the wine tasting experience by switching to concrete flooring. Have you ever thought about bringing the beauty of our surrounding central coast indoors? As a local company in Paso Robles of San Luis Obispo County, we get to see the beauty of our region daily as we drive from one job site to another between Monterey and Santa Barbara Counties. But if you work in an office all day or spend a lot of your time in your home, you may have thought already tried to bring in some of the colors, materials, and textures of the central coast with plants and decorative pillows. But what about your flooring? 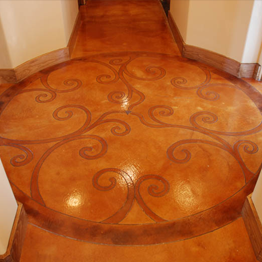 We at Pristine Concrete consider ourselves to me more than mere concrete contractors – we’re concrete artists! And we can bring the beauty of smooth river stones, twisted vines, gnarled oak bark, and tanned rodeo leather right to your concrete using a process of concrete staining with acid. 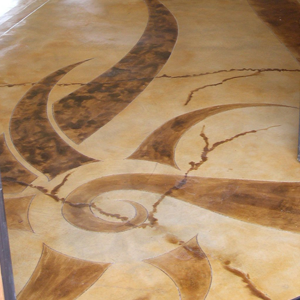 The concrete acid stain lightly etches the concrete to let the color of the stain penetrate it. 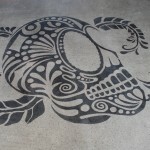 This adds color to the concrete permanently, making it a great solution to beautify high traffic areas in a home or office, or areas exposed to the elements like a pool deck. We can acid stain concrete that is already there, or add it to new concrete if you’re thinking about adding a patio, walkway, garage, or more. For existing concrete staining, it’s important to keep in mind that the acid stain penetrates the concrete by about 1/32”, so weak concrete that is already cracking and chipping may need to be reinforced first. Also, natural color variations are normal, especially in older concrete that may have been previously stained by oil. This happens because concrete acid stains are translucent. For new concrete, it’s necessary to wait 14-28 days to let the concrete cure before staining it, but on the plus side the acid stain in new concrete tends to be more vibrant in color. 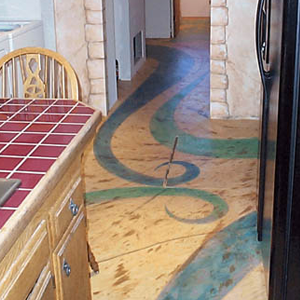 As the decorative concrete experts of the central coast, we’re proud of our designs and we welcome a challenge! 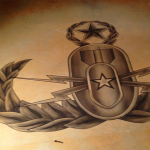 We’ve created sea life, flames, tribal art with 3-dimentional shading, logos, faux granite, a police badge, faux leather… we could keep the list going, but we’d rather just show you. 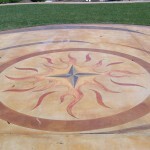 View our some of our favorite acid concrete staining projects below and in our gallery. We also post pictures on Facebook, so be sure to follow us there if you’re looking for more creative concrete inspiration. Wax On or Wax Off? When Was The Last Time You Used Concrete Wax? Do you have ‘wax on’? Did you know concrete floors that aren’t mechanically polished need to be waxed? It’s true. Even if you know there was a concrete sealant put on your floor, it still needs a topical application of floor wax to preserve that sealant. The only exception to the rule of ‘wax on’ is concrete flooring that has been polished with something like HTC Superfloor™ or the RetroPlate Concrete Polishing System®. These polishing systems will grind away the top layer of concrete with a diamond tooling system and instead of a wax or sealer will use a densifier to harden and gloss the surface instead. So when was the last time you waxed your floors? Concrete is becoming more and more popular, and for good reason, but all too often we’ve seen home and business owners with sealed concrete in need of help – and most of them were never told that they needed to wax it. What happens if you go with ‘wax off’? If you don’t wax your concrete flooring, you may soon find that your concrete is becoming discolored in high-traffic areas and that the floor is losing its luster. Wax protects the sealant and the sealant protects the color, so without wax, the color will be damaged, darkened, stained, or lifted. It’s damage that’s completely avoidable. By regularly waxing your concrete and not letting the concrete sealant get damaged, you’ll save yourself a lot of money in repairs. Don’t skimp. Higher-grade waxes tend to last longer without peeling and more coats (especially in high-traffic areas) can last longer when applied properly. Clean before you wax. Removing the layers of wax that are peeling and flaking before putting down a fresh coat will give you a better finish. Do less more often. A big question everyone asks is: “How often should I wax my concrete floor?” but this is unique to every situation based on traffic, wax quality, number of wax coats applied, and the quality of the work done when it was applied. The rule of thumb with wax flooring is to do it more often so that you’re doing less – taking off fewer layers of wax and not having to completely re-do the concrete sealant. The goal of waxing your floor is to preserve the sealant you already have. Let’s first address an elephant in this digital “room” – we aren’t the only concrete contractor servicing San Luis Obispo, Santa Barbra, and Monterey Counties. We know that and we’re OK with it. Why? Because everyone has their own criterion for selecting someone they consider to be the “best;” it’s impossible for us to be the best concrete contractor in San Luis Obispo County for everyone. Maybe someone doesn’t like blue trucks because they got in an accident with one as a teenager. We’d be out of the running immediately. But idiosyncrasies aside, there are a few ways to choose the best concrete contractor for your job that we would like to share them with you. They return your phone call. Nearly all contractors in San Luis Obispo County seem to have a problem picking up the phone anymore. They may be highly recommended by your friend or neighbor, but if they aren’t responsible enough to call you back to bring you on as a new customer, are they going to call you back when you have a problem and need help? They have reviews and/or references to share with you. These days, anyone can (and does) have a website. So owning a website does not make a concrete contractor a legitimate business. Make sure you can read recommendations or talk to a reference or two before you commit. It’s also a good idea to run an Internet search of the concrete contractor’s name (and/or company name) with the word “reviews” and make sure there aren’t other reviews out there they didn’t want you to see. They provide a transparent estimate. Not everyone provides a free estimate as some estimates can take 4-5 hours to prepare (especially if there is a long drive involved), but an estimate should clearly identify where your money is going. You can see samples of their work. Most portfolios are online now, and there are usually even more images on Facebook. Ask where you can find some samples of their work and make sure you like what you see. Ask them questions over the phone or in person. This is my personal favorite – by asking questions on the spot, you’ll get a feel for their personality. You aren’t just giving this concrete contractor a lot of money, you’re also going to be spending a lot of time around them and their team. Do they laugh? Are they friendly? Chances are, they have hired people that are also fun and friendly. If they are more dry and direct, you can expect a team that keeps their noses down and on task, but may feel a little cold at times. Choosing a personality is a personal decision, but make sure it’s on your list of qualifications when selecting the best concrete contractor for you. 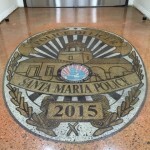 Mike is certainly one of the fun concrete contractors of San Luis Obispo County. As for Pristine Concrete, we will return your call as soon as we possibly can and will often provide the owner’s cell phone number to clients to make sure you get the service you need. Our reviews are on our website and all over the Internet – all positive. We always provide a transparent estimate and we’re currently working on incorporating better software to give you an even easier to read estimate. And we take great pride in the beauty of our work, so you’ll find pictures of it everywhere – our website, Facebook Page, Google+ Page, and more. We would love to talk to you. Fill out our estimate request form on our website or Give us a call at 805-237-9221!